Time’s Up’s most difficult room delivers a polarizing first generation challenge. You and your team are new employees at the bank, but your first day is ruined when you are robbed and thrown into the bank vault by your assailants. You’ve got 60 minutes to get out before the airtight vault runs out of air, but you haven’t been trained on how to unlock the vault from inside! Luckily, your manager, (who fortunately must’ve been playing golf that day,) has left a series of clues inside to help you escape. Walking into the vault didn’t really impress, as it seemed like a sterile bank lobby, coupled with an employee locker room, obviously, theming was not the strong suit of this room. Luckily, there were clues to find and many many locks to solve, (which could be good or bad, depending,) along with what looked like a massive metapuzzle on the wall, which, though low budget, struck me as a pretty cool, and lovingly crafted, design. It was a fairly small room, and with 5 players, it was cozy. Any more than that would’ve been claustrophobic. I wasn’t wrong about the metapuzzle. It easily brought together many parts of the room, and was a satisfying conclusion to the escape, though groups that didn’t pay enough attention would be out of luck. The puzzles were enjoyable to solve, and were all properly clued, allowing just enough of a hint to solve as a team. Most all of the props were fun to manipulate and play with, and led to some interesting perspective puzzles at times. I enjoyed the puzzling for the most part, however some puzzles required a bit of outside of the box thinking that may not come naturally to those that are used to playing other rooms under the standard rules. The overall decor of the room was banal, so the main draw here were the puzzles, which I found to be interesting, but was nothing too mind blowing. 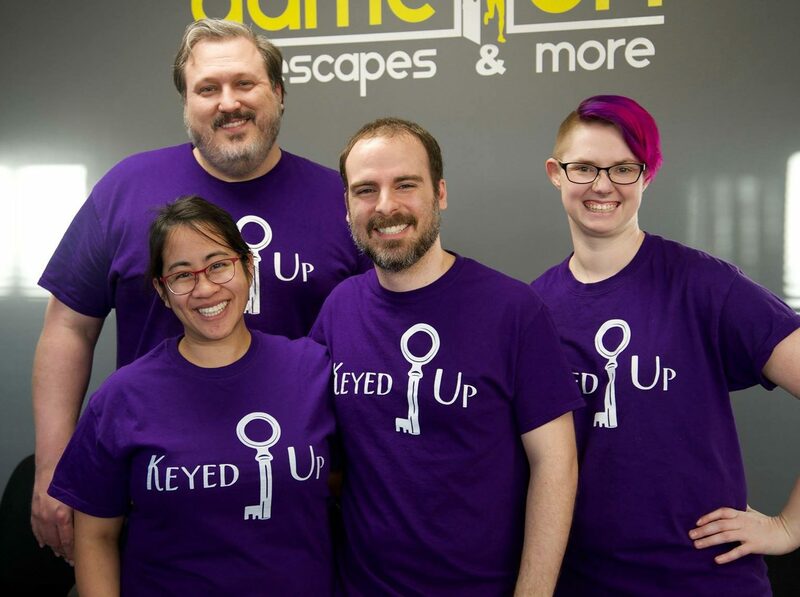 There were a couple instances of solving the lock instead of solving the puzzle, which was a frustrating experience, and there was one lock we bypassed altogether, as we were totally unsure as to whether it had a solution or not. Overall, I think newer groups will enjoy this room much more than enthusiasts, but I also don’t think it would be a great room to begin your escaping career with. Having spoken with other fans, it seems that you’ll either love this one or hate it, and though I had fun with the room, I can definitely see where others won’t be impressed. If you want a deep story or an immersive theme, you won’t find it here, but for an hour of puzzle solving, it might fit the bill. Time’s Up’s owners, however, really do put a lot of effort in, and care about their product, which shows in their interactions with players and upbeat customer service. Book your escape from the Bank Vault here!